This week we’ll be discussing Empathic crystals which actually is more about what has happened to a crystal’s overall shape rather than what kind of shape in which it has grown. Empathic crystals may be any configuration at all. What does this mean? 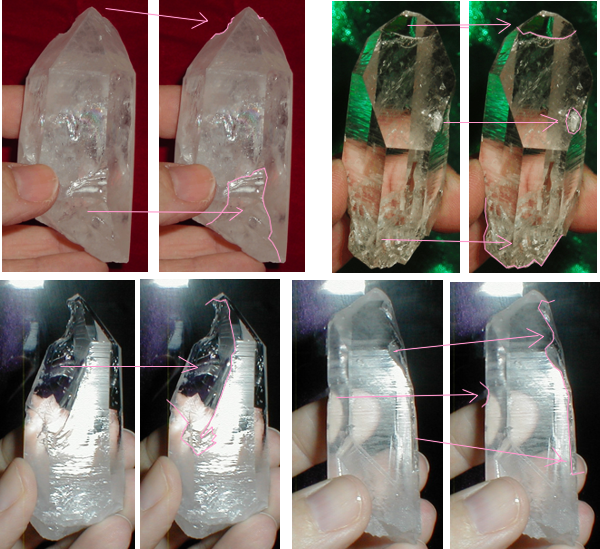 Looking at the crystals pictured below, the crystal on the left is rather non-descript except it has Fairy Frost and the crystal on the right has a large Left Activation Window (Time-Link to the Past), both fall into the category of Empathic. 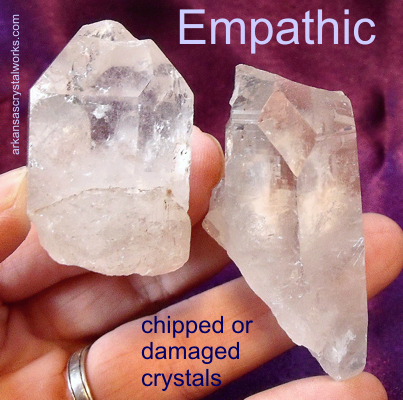 Empathic crystals are crystals which are chipped or damaged in some way. Usually they are damaged in the mining process. However sometimes, even though they may survive the mining process without injury, they get dropped (for example in our homes) and subsequently are chipped, dinged or damaged. Following are some pictures of Empathic crystals. The crystals below have nicks and chunks out of them caused during the mining process. Sometimes damage occurs just externally (chips, chunks, dings) on the body of the crystal (the crystals above are mostly externally damaged). Sometimes they are damaged on the outside (chips and dings) but the inside is also crackled or smashed causing an otherwise clear crystal to look crazed or shattered inside. 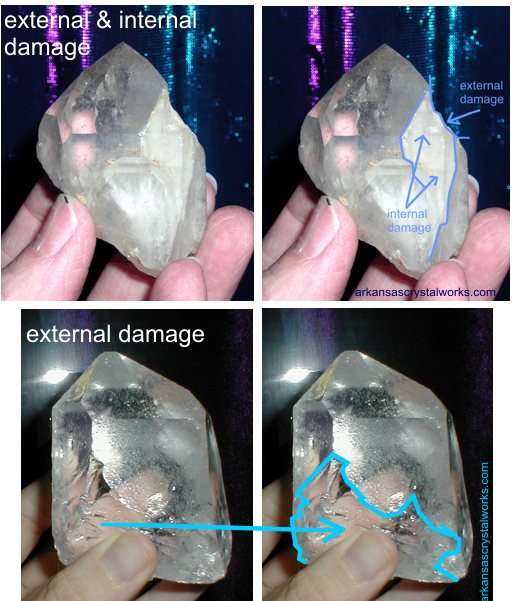 Below is an example of a crystal which has both internal and external damage and another crystal which only has external damage. All of these crystals are called Empathic, I am just describing the various ways it may present. 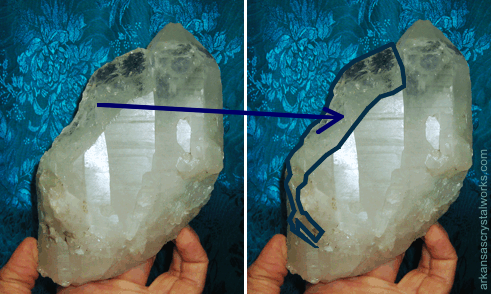 An Empathic crystal might also be nicked, marred and scratched like the crystal below. Empathic crystals bring out compassionate feelings in us. When we see a chipped or damaged crystal, we tend to show it love. The crystal picks up this empathy and amplifies it. An Empathic crystal will encounter many people during its lifespan and each person that expresses compassion for the damage on the point increases the empathetic energy of the point. It is a cycle that repeats. People who tend not to feel compassion still benefit from Empathic crystals because the crystals emit compassionate energy. How might one work with the energy of these special crystals? Any circumstance in which you need to bring compassion into the mix, you might work with an Empathic crystal. I usually find that the compassion needed is often toward self. It tends to be easy to feel compassion for others, but we are much harder on ourselves to be perfect or not “flawed”. If we work with an Empathic crystal, we can see how much we still love this crystal, not simply in spite of its damage, but a lot of times, because of it. We are able to see what this crystal has gone through in its lifetime and it still perseveres. It is still deserving of our love and acceptance. It is still beautiful and worthy. The Empathic crystal helps to remind us to apply the same feelings to our own perceived “flaws”. Take a moment and look at this large crystal which has suffered a tremendous amount of damage. Almost half of its body is missing. You don’t feel any less love for it than if it were “perfect” do you? I have found that many times, a “flawless” crystal will be dropped or dinged while in the care of a person, and the person usually feels terrible about this, that it is somehow their fault and that they have “ruined” an otherwise “perfect” crystal. The message I have received from the Crystal People over and over again, is that more often than not, the crystal has chosen to be damaged in order to assist the person with a lesson on self love and acceptance (and forgiveness!). A further bit of proof of this is that not every crystal which is dropped is broken, and not every crystal which is broken is dropped. 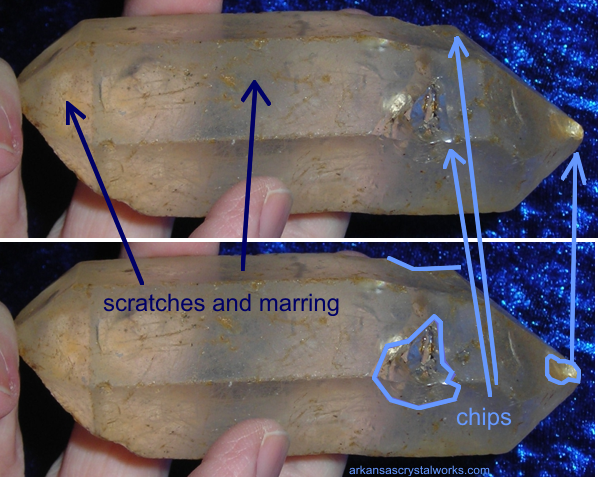 Empathic crystals are crystals which are chipped, marred or dinged. The damage may have occurred either in the mining process or during its lifetime beyond the mine. Empathic crystals bring out compassionate feelings and increase and amplify those compassionate feelings over the course of its lifetime. Crystals may choose to be “damaged” to assist the user in love, compassion and forgiveness of SELF. If you have the chance to adopt an Empathic crystal, notice the love radiating from it, and feel the compassion it instills deep within you. I hope you have enjoyed this discussion about Empathic quartz crystals; what they are, how to determine if you have one, and how to work with them. Next time we’ll discuss Etched quartz crystals and Sacred Sigils. See you next week for Etched quartz crystals and Sacred Sigils. Tagged choosing your crystal, crystal types: empathic, crystals, metaphysical descriptions. Bookmark the permalink. I’m so thankful I came across this post… I felt so much guilt over dropping my quartz point , but now I will just move forward in love, thank you thank you!